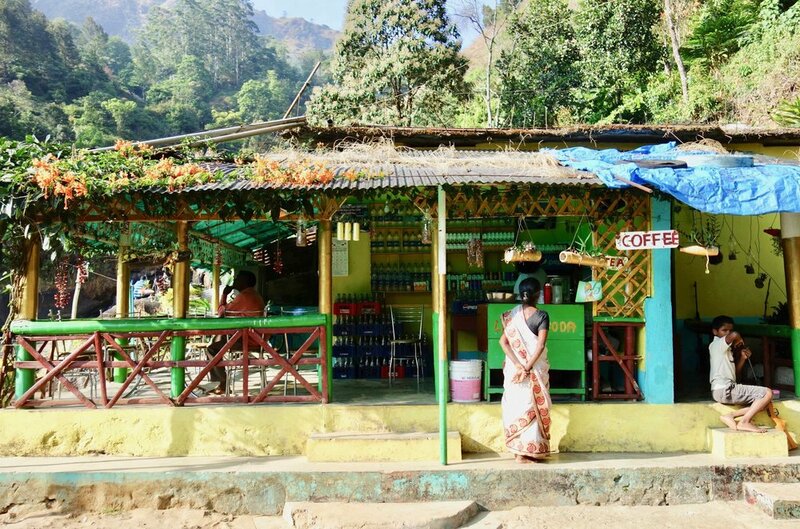 Needless to say, our trip to Munnar was not a breeze, delight, or any positive adjective. While our driver didn’t have a death wish (like previous ones), he too loathed long distance drives (I don’t blame him). He overcharged us, almost fell asleep at the wheel during the most treacherous part of the journey, and insisted on driving 20 mph in the 50 mph stretch that led to our destination. The only upside of these drives is that I sweat so much from fear and frustration that I felt like I got a workout despite sitting on my arse all day. We were so overjoyed by the time we reached Kaivalyam that the sliver of a driveway that dove over the cliff didn’t bother us. The driver went down, inch by inch. We offered to walk on multiple occasions, itching to reclaim our leg muscles and relieve ourselves of the now very hostile driver. The engine was smoking when we reached the bottom. We thanked him with gritted teeth, enjoyed our first hot shower since we’d left the U.K., and sank into our luxurious bed as if it were a cloud. A holistic resort is just what the doctor ordered. “Yes, please,” we said in unison, eyes fixated on the gardens beyond the window, rich with cardamom plants, mango trees, and wisps of clouds stretching across the sky, itching to make up for the meals we'd skipped the day before. We lifted our mugs, expecting the taste we’d grown accustomed to: weak, earthy, drowned in milk. What met our lips was nothing of the sort. Was it sweetened with maple syrup? Hot damn. Who cares what it was sweetened with; it was one of the best coffees we’d ever had. (We later learned that the method for this addictive drink was pouring boiled milk over a sift loaded with instant coffee, sugar granules, and cinnamon.) My eyes widened with each sip. One taste turned into two mouthfuls which turned into a huge gulp… and the coffee was gone. “More coffee, please?” I asked while clutching my mug, eyes still glimmering with delight, desperation sneaking into my stare. This was the start of a very bad habit. Kaivalyam describes itself as: “a tropical flora, a tranquil hideaway, an adobe of serenity” that invites guests to indulge in a "holistic lifestyle with traditional form of yoga and organic way of living and dining.” At first glance, I was hooked. But the deeper I looked, the less authentic it felt. The grounds were impeccably designed, with buildings made of stone and reminiscent of wine country. The gardens scented the property with black pepper, cinnamon, and citrus and the balconies that graced each room overlooked endless plantations. But something about it felt sterile and contrived. If the driveway wasn't daunting enough, the road running through Munnar was another deterrent when it came to leaving the property. The perk of being nestled in a tea plantation is the glorious view, the downside that they stretch for miles and mean that getting anywhere takes a minimum of 30 minutes — the most alluring options, like the national parks, being two hours away. Kaivalyam's solution was an array of daily activities guests could do on the property, including a spice walk, hike to a waterfall, tea tasting, yoga, guided meditation, birdwatching, and a cooking class. On paper, like the resort's description itself, each sounded wonderful, but peeling back the wallpaper proved equally as unfruitful. 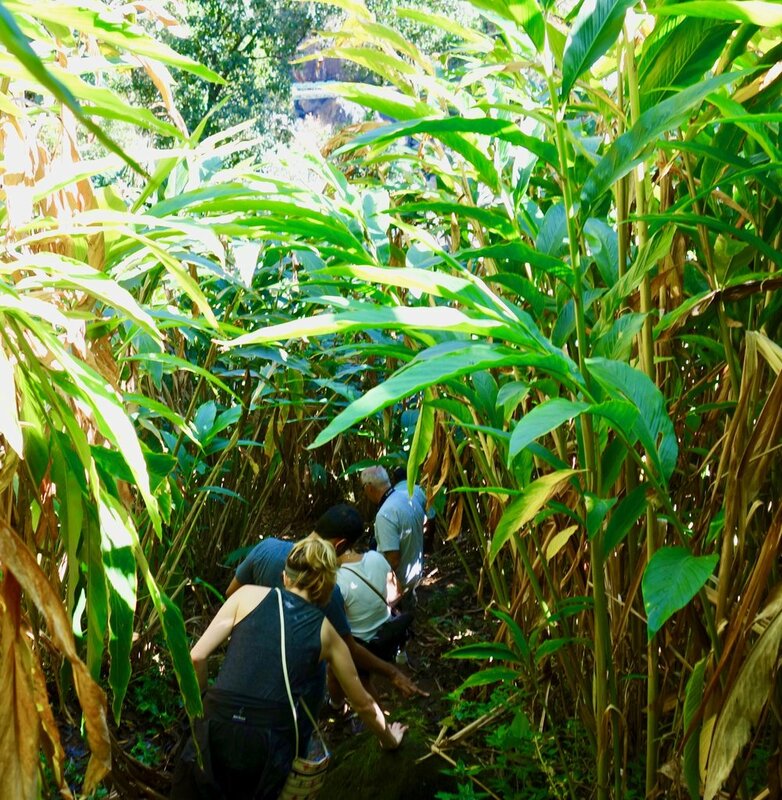 The spice walk took us through the plantation, across a river, and up a steep hill flanked with banana trees. A guide pointed out each plant, picking a few for us to taste. A gentle bite on a raw cardamon pod sent a surge of flavor through my entire body. The taste hardly resembled that which you get from the dried pods and ground spice. Sampling fresh black pepper had a similar affect, and was oddly spicy, finally earning it's pepper name. The slow pace was at times grueling, but a good test in patience — or so I kept telling myself. We arrived for the cooking class at 5:00 p.m. on the dot. One sugar-filled coffee, six biscuits, and 45 minutes later, we began. I was excited to get my hands dirty and learn the secrets of India’s infamous curries. We stepped into the kitchen wearing slippers made from paper towels. I was disappointed when I saw the pre-prepped and pre-cooked ingredients laid out in a line. A translator walked us through a few steps as one of the chefs mixed cooked rice with turmeric, lemon rind, garlic, and oil. A few stirs, and the lemon rice was ready. We moved onto stir-fried cabbage with coconut (delicious) and then to a Keralan banana yogurt curry (the most interesting dish by far, but one I wasn't eager to eat again). The demonstration concluded in 20 minutes, 30 if you include the extra time we spent in the kitchen taste-testing the dishes and playing with a coconut shredder. I admired the chef’s ability to toss spices into dishes on a whim and without measurement, but walked away having learnt very little — and wishing they served wine. The yoga and meditation classes were equally as bland, and at moments, painful. The meditation began with a 30-minute lesson that was unstructured and unrooted. As the cold wind slapped across my face, I battled with my desire to flee the scene. We all fidgeted in discomfort, changing our seated position, rolling the straw mats in various fashions that we hoped we make sitting on tile a bit more comfortable. When we finally closed our eyes, I was desperate for peace, and hopeful that the session would wash away my negativity. But every time I was on the brink of quiet, the guide started speaking again, pulling me further from mindfulness that I'd perhaps ever been. I finally laid on my back, surrendered to savasana, and literally counted the seconds until we were free. I'll spare you what happened during yoga, which can only be described as odd and unsatisfactory. I knew we were doomed when we spent a full 10 minutes jogging from the front of our mat to the back, and back and forth again. I spent much of the class in child's pose — which was arguably the only recognizable pose the instructor introduced. “Yoga was great this morning, wasn’t it?” I couldn't tell if her voice was chipper or forcibly bright. We’d made friends with a British couple on a spice walk the previous day and partook in many of the day's activities together. They'd spent most of their time on their balcony reading book after book, dipping out only occasionally. Turns out, that's the secret to happiness at Kaivalyam. We should've done that, we'd later say to each other. She winced, and we all laughed. "We won't be doing it again," she said. We talked about where we were off to next and our spirits visibly lifted. They were wrapping up a trip that had began with meeting the parents of their daughter's new fiancé. A big Indian wedding was already in the works. We shared the plan for our last few days in India, most of which would be spent on a houseboat. Then she was off. "I want to finish my book before dinner," she said, and flashed the cover of a steamy romance novel. Though we’d been eager for another outdoor adventure, a desire for city life began to rush over us. The countdown to Fort Kochi and Alleppey began, and fortunately, it was only a few hours away.